If a soil test is to be a reliable guide for the addition of fertilizers or lime, the sample tested must represent the soil condition of the area sampled. The specific purpose of the test must be kept in mind, and the completeness of the test desired. Read and follow applicable instructions carefully, the laboratory results will tell you only what is in the sample you send. It is the sample taker’s responsibility to take a truly representative and unbiased sample of the field area in question. 1. 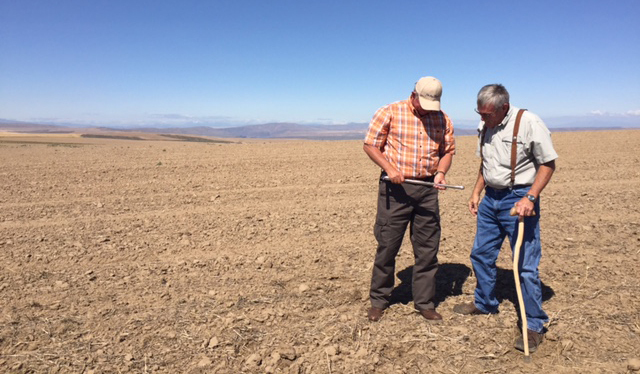 Soils that differ in soil type, appearance, crop growth, or past treatment should be sampled separately, provided the area can be treated separately. A soil map or crop response map can be of help in distinguishing areas and in recording location of samples. 2. Several different tools – such as an auger, a soil sampling tube, or a spade may be used in taking soil samples. 3. Scrape away surface litter. If an auger or soil sampling tube is used, obtain a small portion of soil by making a boring about 6 inches deep, or if plowing or tilling deeper, sample to tillage depth. If a tool such as a spade is used, dig a V-shaped hole to sample depth; then cut a thin slice of soil from one side of the hole. 4. Avoid areas or conditions that are different, such as areas where fertilizer or liming materials have been spilled, gate areas where livestock have congregated, poorly drained areas, dead furrows, tillage or fertilizer corners, or fertilizer band areas of last year’s crop. It is also advisable to stay at least 50 feet from barns, roads, lanes or fence rows. 5. Because of soil variations, it is necessary that each sample consist of small portions of soil obtained from approximately 15 locations in the soil area. After obtaining these portions of soil, mix them together for a representative sample. Samples can be sent dry or wet. Place 2 cups of soil in a soil sample bag or ZipLoc bag. Where soil is very varied and especially where land leveling has been done, or erosion and deposition are severe, the field should be checked on a grid or incremental unit basis. 6. After the sample has been taken, the soil sample bag should be clearly marked with your name, your address, and the sample ID on the outside of the soil bag. Make sure bags match Submission Worksheet. Keep a record for yourself of the area represented by each sample.